This article is about the Jewish educational system. For the private university, see Yeshiva University. For the website, see Yeshiva.co. Yeshiva (/jəˈʃiːvə/; Hebrew: ישיבה, lit., "sitting"; pl. ישיבות, yeshivot or yeshivos) is a Jewish educational institution that focuses on the study of traditional religious texts, primarily the Talmud and the Torah. The studying is usually done through daily shiurim (lectures or classes) as well as in study pairs called chavrutas (Aramaic for "friendship" or "companionship"). Chavrusa-style learning is one of the unique features of the yeshiva. In the United States and Israel, the different levels of yeshiva education have different names. In the United States, elementary-school students are enrolled in a yeshiva, post-bar mitzvah-age students learn in a metivta, and undergraduate-level students learn in a beit midrash or yeshiva gedola (Hebrew: ישיבה גדולה, lit. "large yeshiva" or "great yeshiva"). In Israel, elementary-school students are enrolled in a Talmud Torah or cheder, post-bar mitzvah-age students learn in a yeshiva ketana (Hebrew: ישיבה קטנה, lit. "small yeshiva" or "minor yeshiva"), and high-school-age students learn in a yeshiva gedola. A kollel is a yeshiva for married men. It is common for a kollel to pay a token stipend to its students. Students of Lithuanian and Hasidic yeshiva gedolas usually learn in yeshiva until they get married. Alternate spellings and names include yeshivah (/jəˈʃiːvɑː/; Hebrew: ישיבה‎, "sitting" (noun); metivta and mesivta (Aramaic: מתיבתא‎ methivta); Beth midrash, Talmudical Academy, Rabbinical Academy; and Rabbinical School. The word yeshiva, lit. "sitting", is applied to the activity of learning in class, and hence to a learning "session." The Mishnah tractate Megillah mentions the law that a town can only be called a "city" if it supports ten men (batlanim) to make up the required quorum for communal prayers. Likewise, every beth din ("house of judgement") was attended by a number of pupils up to three times the size of the court (Mishnah, tractate Sanhedrin). These might be indications of the historicity of the classical yeshiva. As indicated by the Talmud, adults generally took off two months a year, Elul and Adar, the months preceding the pilgrimage festivals of Sukkot and Pesach, called Yarḥei Kalla (Aramaic for "Months of Kallah") to study. The rest of the year, they worked. Some variety developed within Lithuanian yeshivas to methods of studying Talmud and mussar, for example the contrast between breadth (beki'ut) and depth (iyyun), or the place given to pilpul (the type of casuistic argumentation popular from the 16th to 18th centuries). 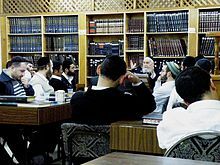 The new analytical approach of the Brisker method, developed by Rabbi Chaim Soloveitchik of Brisk, has become widely popular, though there are other approaches such as those of Mir, Chofetz Chaim, and Telz. In mussar, different schools developed, such as Slabodka and Novhardok, though today, a decline in devoted spiritual self-development from its earlier intensity has to some extent levelled out the differences. Although the yeshiva as an institution is in some ways a continuation of the Talmudic Academies in Babylonia, large scale educational institutions of this kind were not characteristic of the North African and Middle Eastern Sephardi Jewish world in pre-modern times: education typically took place in a more informal setting in the synagogue or in the entourage of a famous rabbi. In medieval Spain, and immediately following the expulsion in 1492, there were some schools which combined Jewish studies with sciences such as logic and astronomy, similar to the contemporary Islamic madrasas. In 19th-century Jerusalem, a college was typically an endowment for supporting ten adult scholars rather than an educational institution in the modern sense; towards the end of the century a school for orphans was founded providing for some rabbinic studies. Early educational institutions on the European model were Midrash Bet Zilkha founded in 1870s Iraq and Porat Yosef Yeshiva founded in Jerusalem in 1914. Also notable is the Bet El yeshiva founded in 1737 in Jerusalem for advanced Kabbalistic studies. Later Sephardic yeshivot are usually on the model either of Porat Yosef or of the Ashkenazi institutions. In 1854, the Jewish Theological Seminary of Breslau was founded. It was headed by Zecharias Frankel, and was viewed as the first educational institution associated with "positive-historical Judaism" (the predecessor of Conservative Judaism). In subsequent years, Conservative Judaism established a number of other institutions of higher learning (such as the Jewish Theological Seminary of America in New York City) that emulate the style of traditional yeshivas in significant ways. However, many do not officially refer to themselves as "yeshivas" (one exception is the Conservative Yeshiva in Jerusalem), and all are open to both women and men, who study in the same classrooms and follow the same curriculum. Students may study part-time, as in a kollel, or full-time, and they may study lishmah (for the sake of studying itself) or towards earning rabbinic ordination. Additionally, Pluralistic Rabbinical Seminary, developed and led by Conservative and Reform rabbis, offers a two year online rabbinical ordination program with a "post-denominational" rabbinical ordination. Hebrew Union College (HUC), affiliated with Reform Judaism, was founded in 1875 under the leadership of Rabbi Isaac Mayer Wise in Cincinnati, Ohio. HUC later opened additional locations in New York, Los Angeles, and Jerusalem. It is a rabbinical seminary or college mostly geared for the training of rabbis and clergy specifically. Similarly, the Reconstructionist Rabbinical College of Reconstructionist Judaism, founded in Pennsylvania in 1968, functions to train its future clergy. Some Reform and Reconstructionist teachers also teach at non-denominational seminaries like the Academy for Jewish Religion in New York, the Academy for Jewish Religion in California, and the Rabbinical School of Hebrew College. In Europe, Reform Judaism trains rabbis at Leo Baeck College in London , UK and Abraham Geiger Kolleg in Potsdam, Germany. None of these institutions describes itself as a "yeshiva". 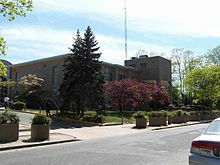 Beth Medrash Govoha (Hebrew:בית מדרש גבוה), in Lakewood, New Jersey, U.S., the world's largest yeshiva outside Israel. Mechina - For Israeli high-school graduates who wish to study for one year before entering the army. (Note in Telshe yeshivas and in Ner Yisroel of Baltimore they call their Mesivtas/Yeshiva ketanas, Mechinas. Beth Midrash - For high school graduates, and is attended from one year to many years, dependent on the career plans and affiliation of the student. Traditionally, religious girls' schools are not called "yeshiva." The Bais Yaakov system was started in 1918 under the guidance of Sarah Schenirer. This system provided girls with a Torah education, using a curriculum that skewed more toward practical Halakha and the study of Tanakh, rather than Talmud. Bais Yaakovs are strictly Haredi schools. Non-Haredi girls' schools' curricula often includes the study of Mishnah and sometimes Talmud. They are also sometimes called "yeshiva" (e.g., Prospect Park Yeshiva). Post-high schools for women are generally called "seminary" or "midrasha". Chavruta-style learning tends to be loud and animated, as the study partners read the Talmudic text and the commentaries aloud to each other, and then analyze, question, debate, and even argue their points of view to arrive at an understanding of the text. In the heat of discussion, they may even wave their hands, pound the table, or shout at each other. Depending on the size of the yeshiva, dozens or even hundreds of pairs of chavrutas can be heard discussing and debating each other's viewpoints. One of the skills of chavruta-style learning is the ability to block out all other discussions in the study hall and focus on one's chavruta alone. This schedule is generally maintained Sunday through Thursday. On Thursday nights, there may be an extra long night seder, known as mishmar sometimes lasting beyond 1:00 am, and in some yeshivot even until the following sunrise. On Fridays, there is usually at least one seder in the morning, with unstructured learning schedules for the afternoon. Saturdays have a special Shabbat schedule which includes some sedarim but usually no shiur. Some Yeshivas permit students to attend college on a limited basis, (although often not encouraged) and this is facilitated by arrangements for the above study to receive credit towards a degree. Schools like Yeshiva University in New York provide a years worth of credit for students who study in Yeshiva for a year. In most Lithuanian and Hasidic yeshivot throughout the world, classes are taught in Yiddish; Modern Orthodox, Zionist, or baal teshuvah yeshivot may use Israeli Hebrew or the local language. Students learn with each other in whatever language they are most proficient in, with Hasidic students usually learning in Yiddish, Israeli Lithuanian students in Hebrew, and American Lithuanian students in English. Yeshivish, also "Frumspeak", is a term used somewhat jokingly for the Yiddish- and Hebrew-influenced English used in Orthodox yeshivas in America. ^ a b Liebersohn, Aharon (2009). World Wide Agora. p. 155. ISBN 9781409284772. ^ a b c Forta, Arye (1989). Judaism. Heinemann Educational. p. 89. ISBN 0-435-30321-X. ^ Berezovsky, Rabbi Sholom Noach (2001). נתיבות שלום [Nesivos Sholom]. Feldheim Publishers. p. 211. ISBN 9781583304952. ^ Kramer, Doniel Zvi (1984). The Day Schools and Torah Umesorah: The Seeding of Traditional Judaism in America. Yeshiva University Press. p. xiv. ^ "Sarah Schenirer a"h, the Mother of the Bais Yaakov Movement, On Her Yahrtzeit, Today, 26 Adar". matzav.com. 2013-03-08. Retrieved 2018-10-06. ^ "Session", in fact, similarly derives from the Latin sedere, "to sit." ^ Goitein, S.D. (1999). Lassner, Jacob (ed.). A Mediterranean Society: An Abridgement in One Volume. Berkeley: University of California Press. ISBN 9780520240599. Retrieved 2018-10-06. ^ Elazar, Daniel J. "Can Sephardic Judaism be Reconstructed?". Jerusalem Center for Public Affairs. Retrieved 2018-10-06. ^ Steve Strunsky (April 16, 2019). "Lakewood yeshiva looks to use old golf course for new campus". New Jersey On-Line LLC. Retrieved April 16, 2019. Beth Medrash Gohova is said to be the world’s largest Jewish-affiliated university outside of Israel. ^ Stephen Stirling. "10 ways Lakewood is unlike anywhere else in N.J." NJ Advance Media. Retrieved April 16, 2019. The sea change can be pinned to one event: The founding of the Beth Medrash Govoha yeshiva in the mid-20th century. The Orthodox Jewish community has set down roots en masse around the religious school, which is now the largest yeshiva in North America. ^ "Bringing the People Together". Reb Jeff. 24 February 2011. Retrieved 23 June 2011. ^ Zobin, Zvi (1996). Breakthrough to Learning Gemora: A Concise, Analytical Guide. Kest-Lebovits. pp. 104–106. ^ Neusner, Jacob; Avery-Peck, Alan J. (2001). The Blackwell Reader in Judaism. Blackwell Publishers. p. 422. ISBN 0-631-20738-4. ^ Finkel, Avraham Yaakov (1999). Ein Yaakov: The Ethical and Inspirational Teachings of the Talmud. Jason Aronson. p. xxix. ISBN 0-7657-6082-7. ^ "Guide To Degree Completion Programs for Yeshiva Students". YeshivaDegree.com. 2011. Archived from the original on 2012-04-02. Retrieved 2018-10-06. ^ Philogos (2011-02-23). "How to Understand Yeshivish". The Jewish Daily Forward. Retrieved 2018-10-06.